I pulled out the little genie-looking bottle with the cream-colored swirled cap recently and got very curious. What could I find out about this beautiful fresh floral chypre, its namesake, and its availability? I guess you could say I found some things out, but they all added up to a bigger mystery than before I started, in some ways. The Italian perfume aesthetic is, of course, completely different. What I call cashmere indigestion. They like floral Orientals, spice, and flowers together, that sort of warm, uniform, suntanned beauty with no chic whatsoever. Middle-class taste writ large. There's a couple of really great Italian fragrances, mind you. Helietta by Princess Helietta Caracciolo. I actually tracked her down at her shop in Rome recently to ask her if she still had any of the fragrance. She's a sweetheart. Orange-peel chypre with a woody angle. And Teorema by Fendi. But in general, Italian perfumery — I essentially look down on it. It's boring. Nothing is more nauseating than good taste in high doses. You could say that Helietta smells regal, strong, and carefree, like many feminist-era '70s fragrances. Speaking of the year it was released — there was no information to be found. 1980, maybe? I tracked down a trademark page indicating that Caracciolo trademarked her name in 1980. Helietta Caracciolo is related to Marella Agnelli who was born a Principessa Caracciolo di Castagneto. I think you must look for Helietta’s heyday during the 60’s and the beginning of the 70’s during which the Cinecitta Studios were believed to become the new Hollywood and aristocratic ladies actually began to work for their money. Helietta’s main claim to fame was that she designed the World’s first round handbag for Jacqueline Kennedy and some jewellery for Death in Venice and some other classics. Anyway, I loved this perfume, and you should try to find it if you can (close to impossible? ), but perhaps you can see why I'm left scratching my head. regards, Martina - who is frantically baking cookies..
Hey there, Martina. Could you send a URL? I don't know how to access the image (of HER) you've tantalizingly dangled before me! Thanks!! Spell-checked by Luca Turin himself! I don't know whether to laugh or cry. More comments, Luca! I'll learn Italian (or use spell-check more often), I promise. 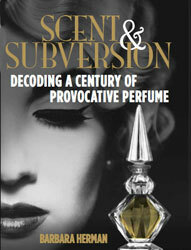 I am on a vintage-perfume-exhib tomorrow, where collectors sell what they do not longer want to keep. I will have an eye open. And a list with my wishes for Xmas... BTW - I found two "miniatures" in German Ebay. The bottle is molto eleganza. I know, Mary. I love it! The box, not so much. Martina: Good luck on your search! Sounds exciting. Well - I did not find THIS one, but I got a Guerlain "Rosebud" Flacon "Chamade", still sealed ,for a steal. I do not even dare to tell you what I paid... was my lucky day, together with two sealed bottles of Guy Laroche FIDJI. YUmmmm. Pictures soon on my Blog, of course. Wishing a cosy 4th of Advent ! Both of them are beautiful, Martina. Enjoy them! It was more a comment on the vanity of Luca Turin than on your blog, which after all I read religiously and enjoy immensely! Pretty random, eh, Heather? Love the perfume, though! Did you notice Luca stopped by to correct my spelling? Does anyone have a current email address or website URL for Helietta? I own her famous round metal evening bag and am putting it on the market. Thanks so much!